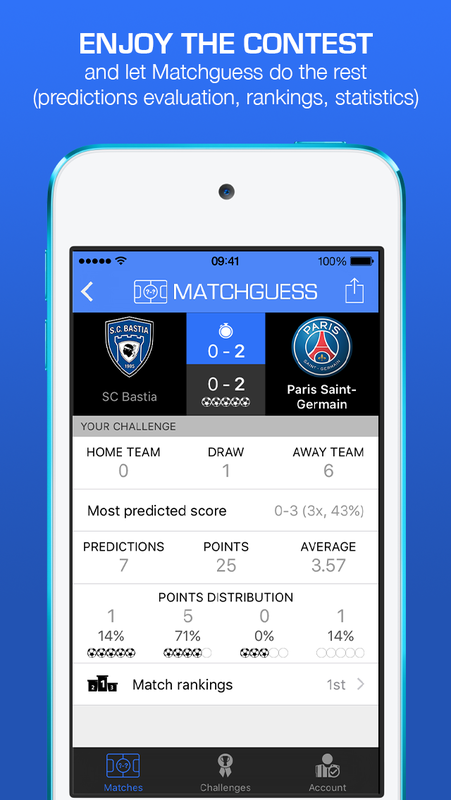 Matchguess is a social prediction application on football matches. It aims to replace the spreadsheet files regularly produced around the world for prediction contests. The app includes the most popular national (from England, France, Germany, Italy, Spain), continental (European Cup) and international competitions (European Championship, World Cup, Summer Olympics). 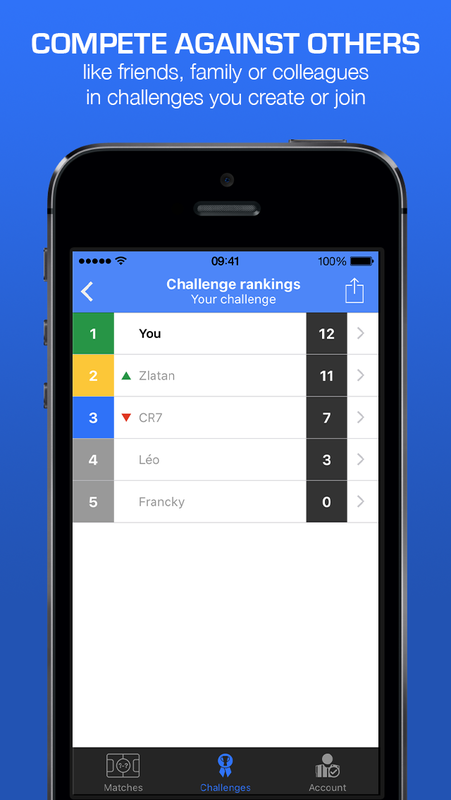 Main functionalities: 1) Predict match scores from the application launch without even having to sign up. Do so at your own pace, but before the start of each match. 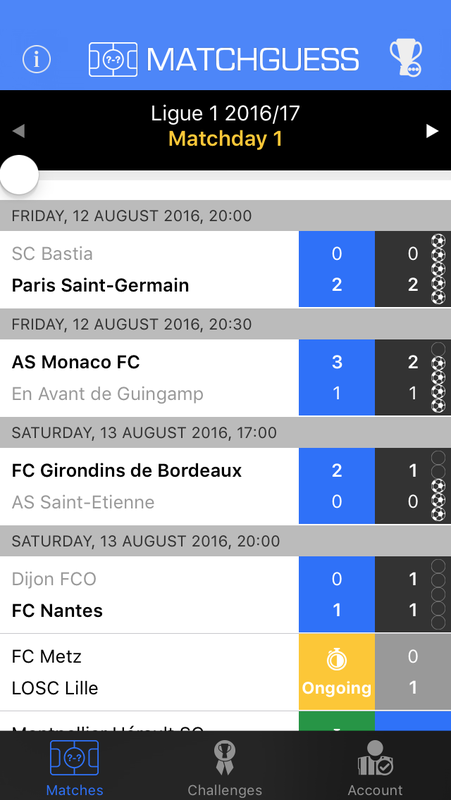 The goal is to accumulate the most points by predicting a maximum of matches and being as accurate as possible. 2) Compete against other players [*]. Start by creating an account then a challenge. Invite friends, family, colleagues and even supporters of your rival team by giving them a simple access code. You can also join an existing challenge if you are not its organizer. 3) Enjoy the contest and let Matchguess do the rest. You know quickly if your predictions are good or not and you can compare yourself to others through various rankings and statistics. You will never forget to participate in some matches, it's in your pocket! You don't have to recover the predictions of the other players, it is automatic! You no longer have to wait for the organizer to do it, points are calculated whenever a final result is known. You no longer will risk making mistakes calculating the points. The rules of the game are set in advance: - an exact score, 5 points - a close score, 4 points - the right winner or draw, 3 points - otherwise, nothing at all Don't you like other sports? 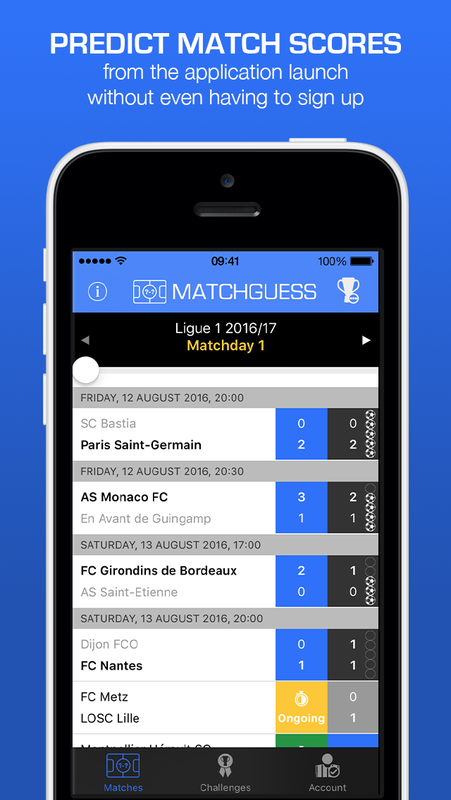 Just give a try to our sister app: Matchguess Basketball. Qu'est-ce que tu me racontes là ? This page is also available en français. [*] Within the limit of 23 participants in a challenge. Beyond that, please contact us to discover our special offers.